Cloverdale Automotive & Tires sells and services car and truck tires in Cloverdale California area. We offer a wide range of tires for most vehicles. Whether you need a wheel alignment or tire rotation Cloverdale CA Automotive & Tires can assist you with your tire needs. Our knowledgeable staff can assist you with your passenger car tires, SUV Tires, truck tires, trailer tires, or commercial fleet tires in Cloverdale CA. See us for tire sales, tire service, tire repairs in Cloverdale CA. Wheel alignment, tire balancing, flat repair, tire rotation, truck tires, trailer tires, performance tires, custom wheels, new tires, used tires. Cloverdale Automotive & Tires sells all National brands of tires. 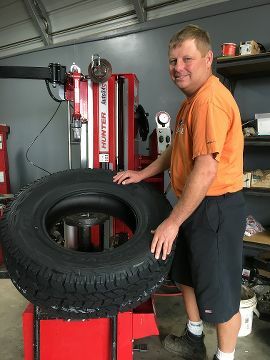 Our state of the art Hunter Engineering tire change machine can easily handle today's performance tires up to 20” inch large diameter tires, rims, wheels with no risk of damage. This high tech machine accommodates all wheel types from stock rims to oversize custom wheels on any vehicle type from classic cars, custom cars, lifted 4x4's, fleet trucks. 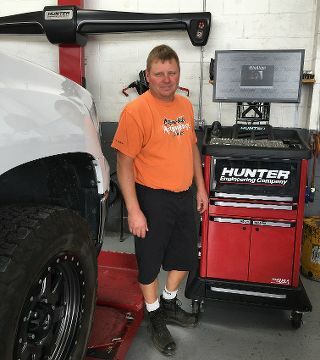 We also use a Hunter computerized tire balancing machine for the most accurate in tire balancing. This machine performs large diameter custom wheel balancing. Wheel alignment service in Cloverdale CA. We do 4 wheel alignment, car wheel alignment, truck wheel alignment, 4x4 wheel alignment, and fix wheel alignment problem. Call us for a wheel alignment cost and wheel alignment repair estimate. Our wheel alignment equipment is top of the line equipment made by Hunter Engineering Company. This computerized Alignment Equipment can align your vehicle back to factory specifications, giving you the best ride possible. In addition, the computerized equipment will provide a color print out of your vehicle prior to and after your alignment so you know exactly where your alignment was off and the corrections we made to correct it. Automobile tires are described by an alphanumeric code, which is generally molded into the sidewall of the tire. This code specifies the dimensions of the tire, and some of its key limitations, such as load-bearing ability, and maximum speed. In this example, the tire has the number 95H. This is the load or weight carrying capacity of the tire. However, in most cases, you will not see this heading on the sidewall.